In total awe of how quickly time is flying by, yet once again, the family calendar is becoming bombarded with various activities and commitments for the year. However, amongst the busyness, you can’t help but see her and are so keenly aware that your daughter is growing up right before your eyes. We all remember those years, and so, as Mothers, we can not help but crave in the depths of our souls to be a safe place for our loved ones, as well as a nurturing voice to speak love, value, and eternal truths into their growing hearts. 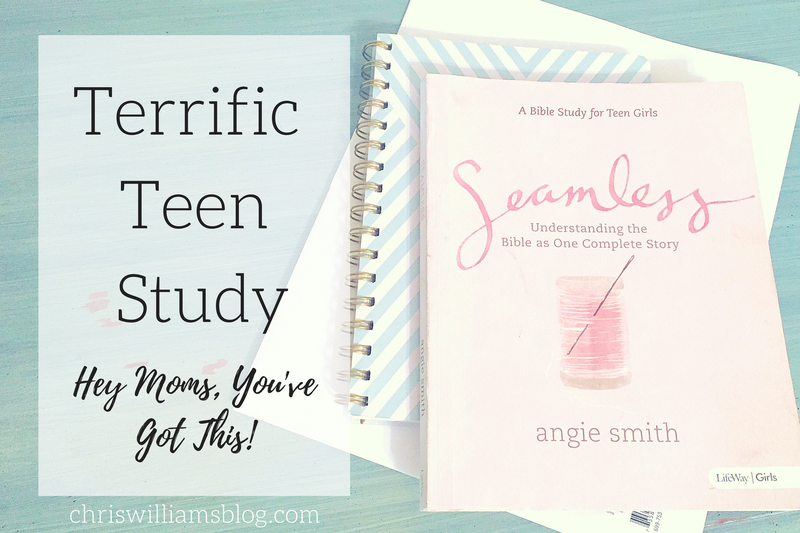 Carving out some intentional time to bring encouragement into your daughter’s life right in the middle of all the demands and pressures of her ever-changing-fast-paced world just might be one of the most important things you do for her this year. 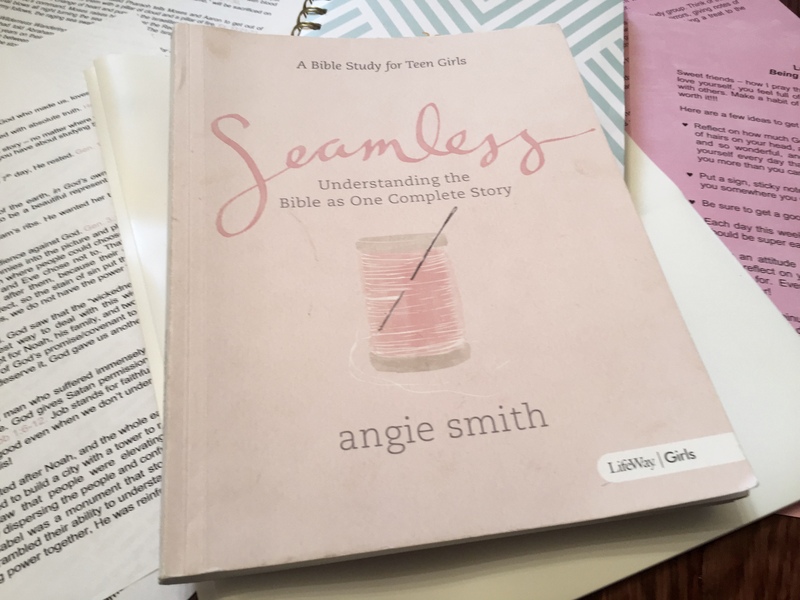 Thankfully, Angie Smith, the beyond adorable and infectious writer of SEAMLESS, A Bible Study for Teen Girls, has blessed us with her mission to make the Bible approachable and enticing for girls. 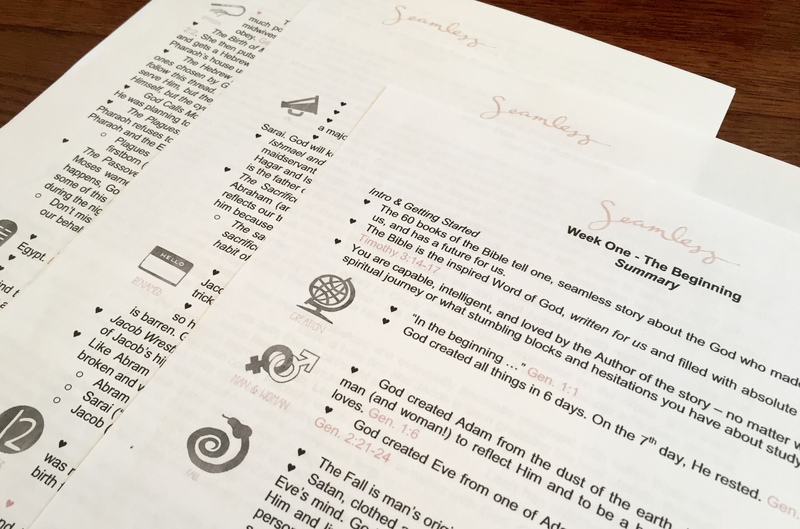 In seven stylish and creative sessions, Angie threads together the people, places, and major events of the Bible into one cohesive storyline. 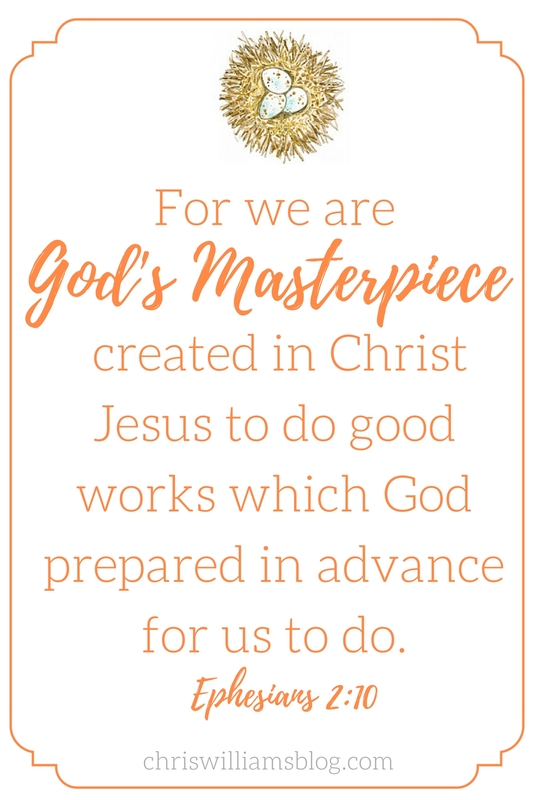 From Genesis to Revelation, she brings connection, clarity, and understanding of God’s redemptive plan for His children while making understanding God’s Word, the Bible, not only do-able, but also relatable and fun. Last spring, a friend and I had the opportunity to co-host this amazing study for our daughters and a few of their friends. As much as we hoped this time would be a blessing for these precious soon-to-be teenagers, I can’t even begin to tell you how much our hearts were touched spending time with each of them. What a privilege it is to have children gather in our homes, to be a voice of encouragement in their lives, as well as to point them to the truth of God’s Word. Hosting a Bible Study in your home doesn’t have to be hard or time consuming. As a matter of fact, nothing is more cozy and relaxing than kicking off your shoes, grabbing a bunch of snacks and smoothies, and piling on a couch together for some girl time. Once the decision was made as to which day of the week would be best for our gatherings, we previewed the study and the length of videos; we even brainstormed about what we wanted to accomplish with the girls as well as how much time would be needed per session. Since many of the girls participate in other after-school and evening activities, we found keeping our meetings to 1 ½ hours in length would be best for all. We wanted each of the girls to know how thrilled we were to have them participate so we created cute gift bags that were delivered to their doorsteps one week before the study began. To keep things manageable and cost effective, we enlisted lots of help from the parents. They graciously helped with carpooling and providing weekly snacks and beverages. One of our hopes for this study was that it would be a vehicle for more open conversations about the Bible in their own homes. Therefore, we encouraged each Mom to also purchase a copy of the Bible study and work on it at home so they would know what their daughters would be learning each week. To help with conversations starters we made summary handouts to send home to the parents to use as talking points throughout the week. 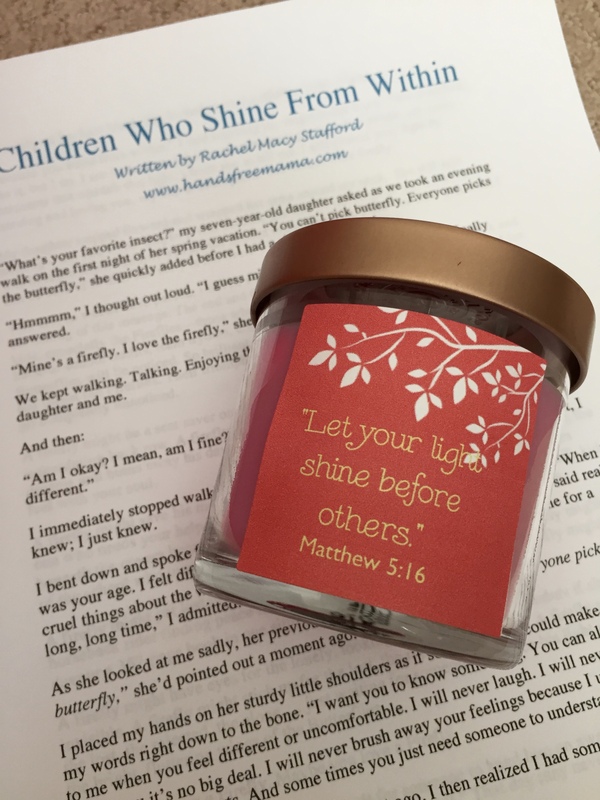 To keep the girls motivated to do their Bible Study homework in addition to their schoolwork, we decided to have little prizes for those who were able to complete the weekly assignments. Simple dollar bin goodies such as lip gloss, nail polish, as well as sample size lotions and hand sanitizers were loved! Homework discussion time became fun as we turned each question and answer session into a game by setting a timer for the length of time we had while utilizing our yummy “Love Bucket” which was filled to the brim with candy. The quicker the questions were answered correctly, the more candy they received! 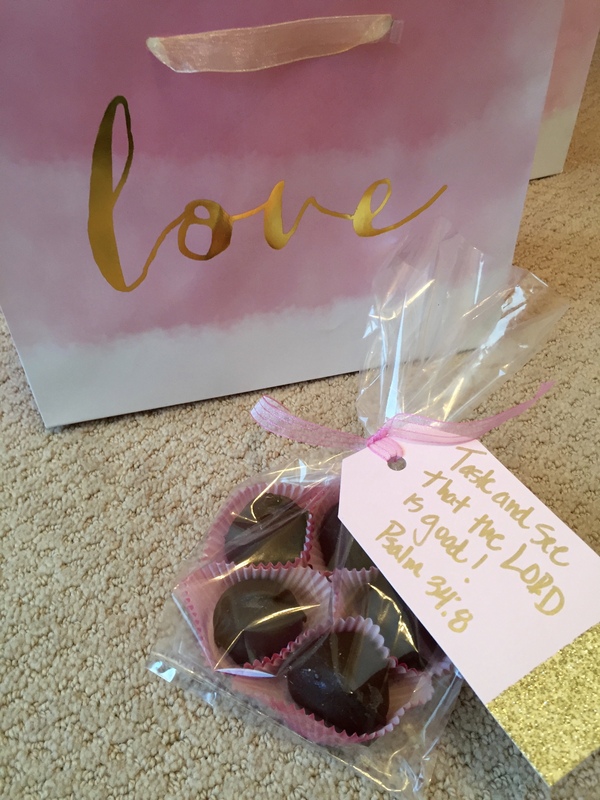 After watching Angie’s DVD teaching sessions, we challenged the girls to share God’s love with others through my friend, Mary’s, Kindness Project. 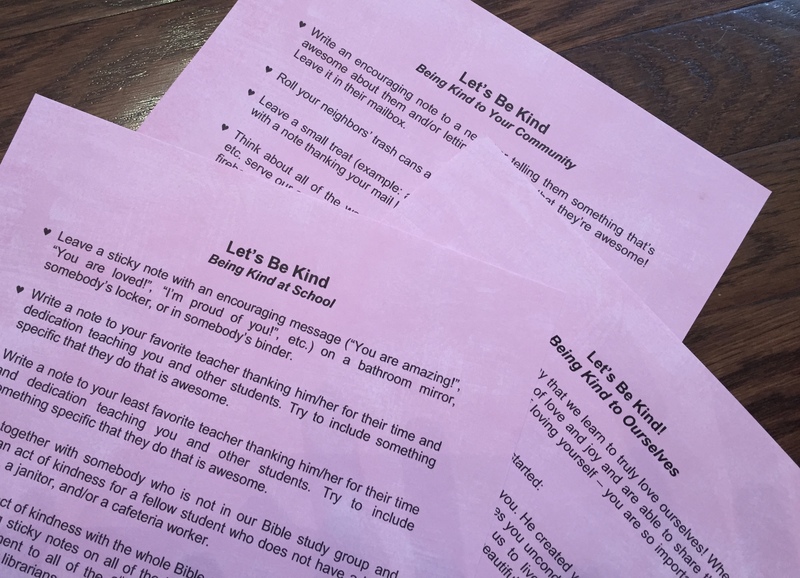 Each week they were given examples of how they could show kindness to someone in unexpected and thoughtful ways. Little slips of paper were provided and as they did an Act of Random Kindness (ARK), they wrote it down; we displayed them all on our wall. After seven gatherings, it was wonderful to see all the ways these young girls were making a positive difference in other people’s lives! Last but certainly not least, we ended our sessions in prayer by lifting each girl up by name thanking God for all the talents, abilities, and gifts that He had placed in them. We also expressed how thankful we were for this fun time dedicated to learning God’s Word together. Aren’t they adorable! Future world changers for sure! As leaders, our hearts were truly filled with JOY to be a part of such an intentional time of encouraging our next generation, pointing them to truth, reminding them that they are loved with an everlasting love, as well as showing them that they can make a difference TODAY in the lives of others. I was so thankful we took this short amount of time to make this happen, and I think you will feel the same way. 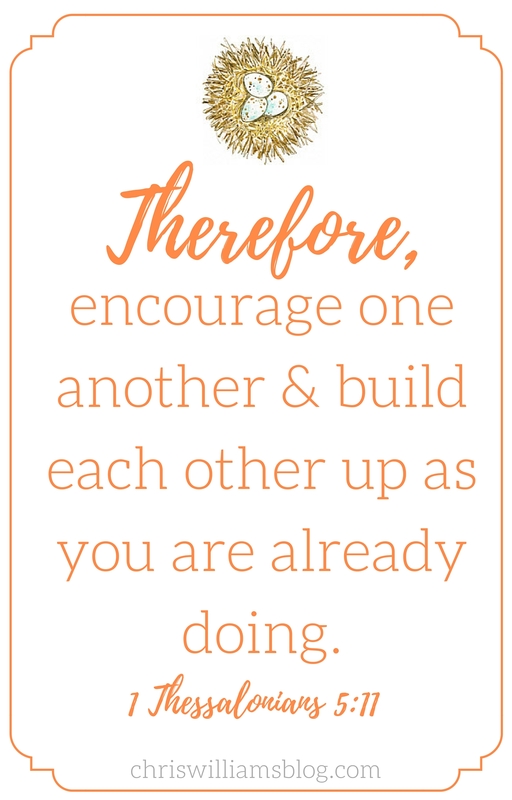 This year, let’s encourage one another to equip our children in the truth of God’s Word! What a wonderful idea! I love everything about this. 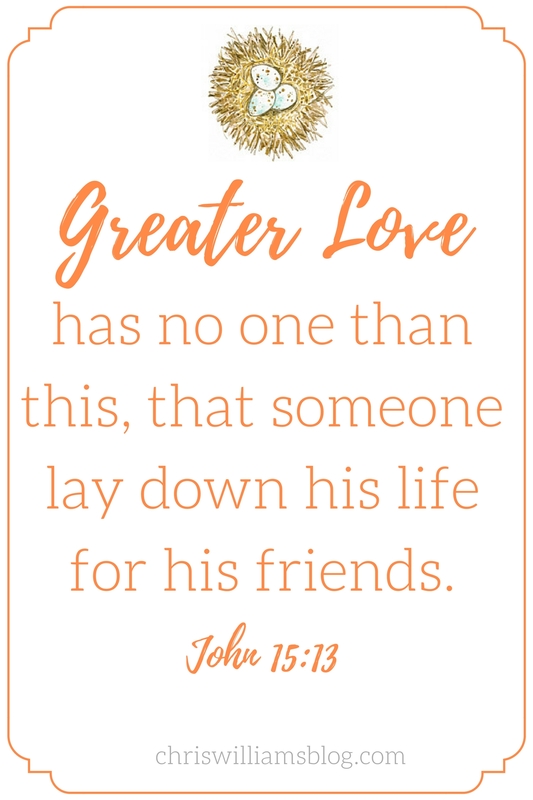 Thank you so much for sharing this Bible study – will keep it in my back pocket to mention it to others! This is awesome!!! I don’t know where you find the time!!! I feel like I can barely keep up but I would love to give this a try!! 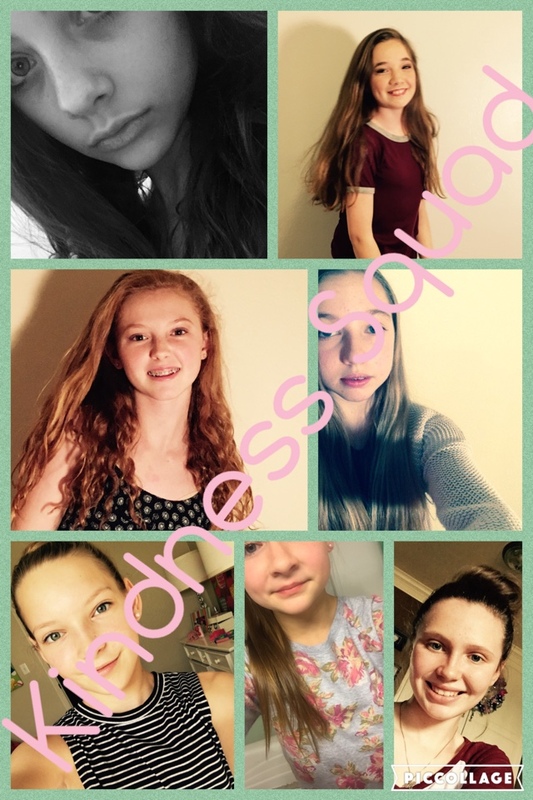 Thanks for sharing this!!! I so admire your heart for your daughter and her friends at such a critical time in their lives. Great post as always! Thanks for sharing! Very helpful, my daughter is 3 years old, but I enjoy hearing from others who have gone ahead of me! ☺ Grace and peace!